Jaws Of The Flying Carpet - "Blue-Eyed Sunburned Easter Island Babies" / "Live At The Whipping Post" / "Noisy Music For Dancing"
Jaws Of The Flying Carpet - "Blue-Eyed Sunburned Easter Island Babies"
Jaws Of The Flying Carpet - "Live At The Whipping Post"
Jaws Of The Flying Carpet - "Noisy Music For Dancing"
The Jaws of the Flying Carpet are an Ottawa, Canada based improvisational musical group consisting of 6 musicians, whose main influences are bands like Henry Cow, Faust, Ornette Coleman, Captain Beefheart, Sun City Girls and Frank Zappa. This CD contains 19 improvised tracks of a wide variety of styles that it is very difficult to describe. It was recorded from May to November 2000. The band has existed since 1984 and has released several other releases in cassette form. Noisy music for Dancing was recorded live in 1990 and Live at the Whipping Post was recorded in 1995. The band uses all sorts of instruments not just synthesizers, guitars, bass and drums. Included at times are bawu, zhanzi, saw doo-ung, didgeridoo, clarinet, recorder, marimba and all sorts of hand percussion. I have to say this is not the type of music you listen to on Sunday morning but these guys do have a special talent and most of the compositions are quite interesting and offer a lot musically, even though some might find the music a bit challenging. If you like Henry Cow, you deserve to hear these guys! 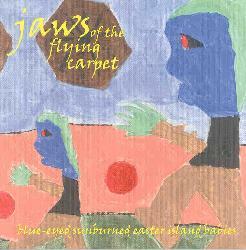 For more information you can visit the Jaws Of The Flying Carpet web site at: http://www.thebabyuniverse.com. Contact via snail mail c/o Outdoor Planet; 6397 Glen Knolls Drive; Orleans, Ontario; K1C 2W9; Canada.